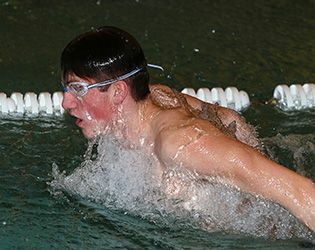 Over the past several days, the varsity swimming team has been gearing up for the Prep B Championships, which will be held at The Lawrenceville School today and tomorrow. The boys' competition begins at 2:00 p.m. today, and the girls' event at 1:00 p.m. tomorrow. For anyone who cannot make the event, the competition will be available via live stream. 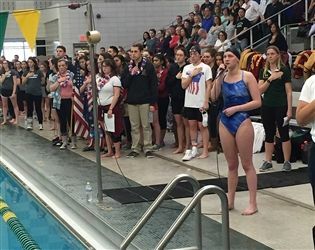 Last Thursday, the team honored its seniors, co-captains Gabby Breuer and Emily Supron, at senior night, which was held during a tri-meet against Morristown Beard and Wardlaw Hartridge. Breuer sang the national anthem at the event. The Knights placed second at the meet, defeating Wardlaw Hartridge. Highlights included a first-place finish for freshman Rebecca Michaels in the women’s 100-meter backstroke. During the Somerset Country Championships this past weekend, Michaels claimed that number nine spot for that event. Best of luck to our swimmers. Go Knights!